During the past offseason, I think we all became sick of the numbers “37-35.” Pirate management mentioned the team’s 2006 second-half record during virtually every interview between October and April, consistently neglecting to discuss the 30-60 record the team had before the break. Considering the Pirates, despite their recent surge, are only 20-29 since the break this season, management will need a new positive spin method for the upcoming offseason. I thought I would get a head start and help them out a bit. It is time to take the Pirates’ second half offensive numbers and extend them over 162 games. Of course, nobody will mistake that lineup for the 1927 Yankees. But these statistics are much easier to stomach than the team’s overall numbers. In 49 games since the break, the Pirates have scored 253 runs. That pace would give the team 837 runs over 162 games. Entering the above hypothetical lineup into Baseball Musings’ lineup analysis tool, the Pirates would be expected to score 5.152 runs per game. Over 162 games, that would equal 834 runs. 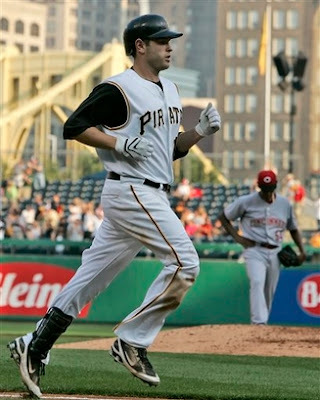 * In 2006, 834 runs scored would have left the Pirates tied for seventh in Major League Baseball. That is a respectable ranking. So what does this all mean? It means that scoring 253 runs and allowing 265 runs after the All-Star break is only marginally more effective than scoring 367 and allowing 427 before it. But we can expect to hear quite a bit of Pirate management citing the “much improved offense” as a reason to expect success in 2008. Unless we are expecting Freddy Sanchez to consistently slug over .600, it will be just another hollow promise. *This run total does not account for Josh Phelps’ 1.324 second-half OPS coming off the bench.